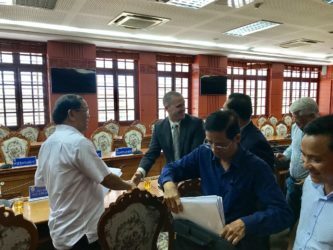 ANN ARBOR, Mich., – July 24, 2018 – Kraig Biocraft Laboratories, Inc. (OTCQB: KBLB) (“Company”), the leading developer of spider silk based fibers, announces today that Jon Rice, the Company’s COO, held meetings with senior Vietnamese officials, in Quang Nam, and US government officials, at the US Embassy, in Hanoi, Vietnam, to advance its production ramp-up plan for Prodigy Textiles Co., Ltd. The Company has already received its business license for Prodigy Textiles and its investment authorization for up to $2.2 million, to fund the first phase of its spider silk commercialization scale up efforts in Quang Nam. This approved first phase includes the importation of the Company’s hybrid silkworms and production of Prodigy Textiles’ unique high performance silk. 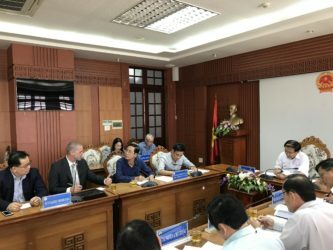 During the meeting with officials in Quang Nam, the Company requested an acceleration of the project schedule, including authorization and the investment license for the second phase of operations, with a total investment cap of up to $50 million. The second phase of the Company’s investment plan includes the development of a 50 hectare parcel of land and the construction of a new dedicated factory, designed to support the Company’s five year expected recombinant spider silk production output needs. The Company has already begun to work with a local architectural firm to develop the plans for this unprecedented facility and spider silk production complex. This entry was posted on July 24, 2018 by Admin.